Register now for the 2018 Pastors Conference in San Antonio, Texas, January 30-February 1! 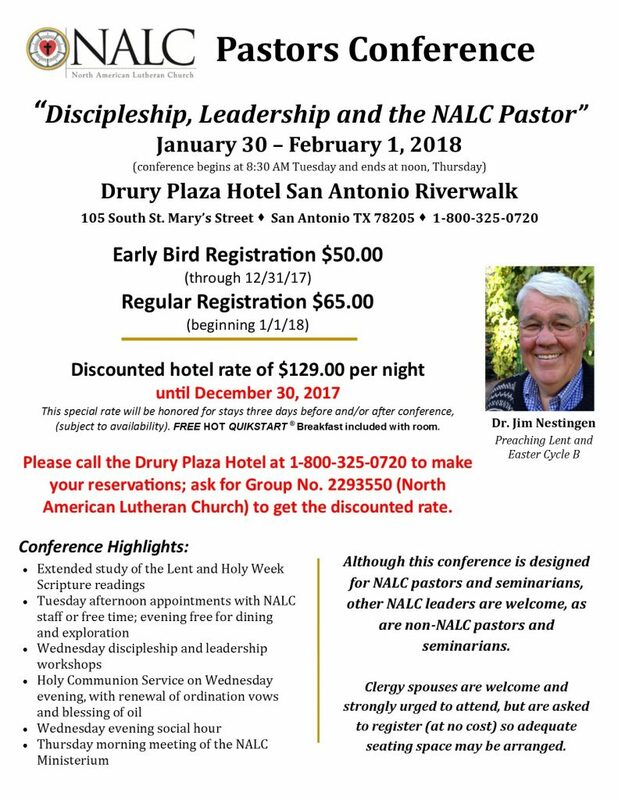 There will be a seminar for pastors who are interested in learning more about what it means to be “discipleship coached” on Monday, Jan. 29, prior to the NALC Pastors Conference. The 7:00 p.m. Monday evening seminar will be at no additional cost to pastors attending the conference. Ground Transportation: The Drury Plaza Hotel does not provide shuttle service from/to San Antonio Airport (SAT), which is 9.6 miles from the hotel. There is no self-parking at the hotel; only valet parking is available ($23.00 per night). Airport to hotel transportation options include rental cars, taxi and rideshare services such as Lyft and Uber. For groups of four or more traveling together, Star Shuttle (http://starshuttle.com/; 800-341-6000) offers standard van service for 4-12 passengers.